Tangy and creamy cheesecake full of juicy strawberries, chocolatey graham cracker crust, chocolate cover strawberries and drizzled with ganache. This recipe was requested by nephew, who's 11th birthday is coming up, he asked for a cheesecake as his birthday cake and he loves strawberries especially chocolate covered strawberries. So I put two together and created this recipe, strawberry chocolate cheesecake. My nephew is excited and already has thanked me for the cheesecake before I made it. I would make the cheesecake I used frozen strawberries because they would give me some of the strawberry juice and softer than fresh. 1. Preheat oven to 350 degrees. Crust graham crackers to a fine crumb. Combine 1/4 cup of sugar and pinch of salt. Add slightly cooled butter to the crumbs then add to a 9 inch Springform pan. Even out the crumbs all over and bake for 5 minutes. Let cool for 5 minutes. 2. In a large bowl, cream together cream cheese, sour cream, sugar, vanilla extract, salt until for 1 to 2 minutes. Lower the speed of your mix and add in eggs one at a time. Fold in frozen strawberries with the juice and lightly mash. 3. Add cheesecake batter to cooled crust. Place pan into a Dutchoven or lasagna pan then add hot water to the pan 2 inch up the pan, making sure not to get any water into the cheesecake. 4. Lower the temperature of the oven to 300 degrees and bake cheesecake for 70 to 80 minutes. Turn off oven and let sit for 1 hour with the oven door closed, do not open the door. After 1 hour, open the door slightly and let it sit for another 1 hour. Remove from the oven and let it cool to room temperature about 3 to 4 hours then cover and chill for 12 to 24 hours but the longer the better. 5. At least one to two hours before serving, dip strawberries into chocolate and coconut oil mixture. Place on top and let set. For ganache, heat cream until barely boiling. Add to chocolate chips and let sit for 2 to 3 minutes. Whisk until thick and let cool for 10 minutes. Drizzle over cheesecake and let set until serving. 6. Keep the cheesecake cover and store in the fridge for 3 to 4 days. This looks delish and oh how I LOVE cheesecake. I don't think I ever had chocolate, strawberry cheesecake though. Another MUST TRY! Thank you! This is a perfect dessert for fresh picked strawberry season! What a gorgeous cheesecake! I'm sure your nephew just loved it. Awesome dessert when we have strawberries available to us in abundance. Oh my gosh! This cheesecake looks so yummy--definitely going to give it a try! Thanks! This strawberry chocolate cheesecake looks like heaven! I will definitely be saving this recipe and trying it for the fam, thanks for sharing! This looks so yummy!! i will be making this soon! Cheesecake is one of my favorite desserts! I love this delicious combo too! Chocolate. Strawberries. Cheesecake. This is one of my favorite trios. However, I can't believe that I haven't had all three yet. I think I know what I'm going to be eating for dessert this weekend! Ooo this is great when you don't know what to do with strawberries and left over chocolate! Oh yum! That looks delish!! I need to order a springform pan! I love all the different components to this recipe and can't wait to make it! My husband would flip for this! He is a cheesecake man! This looks absolutely delicious and very timely since my parents are coming over this Saturday and they both love strawberries. Sol excited to make this cheesecake. Thank you for sharing the recipe. This looks absolutely delicious!! 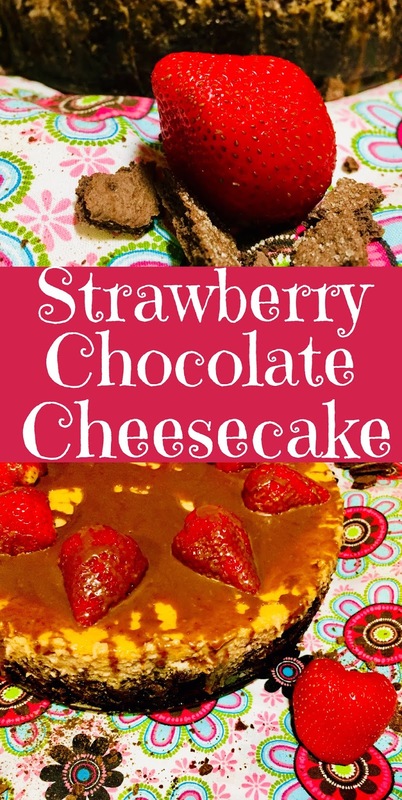 My kids just adore cheesecake and chocolate so I’m sure they will love this! Cheesecake is my favorite dessert ever, but I've never been brave enough to try to make it myself! May have to try making this recipe. Yumm! I have never tried a cheesecake like this before! Your recipes are always mouthwatering!! I love cheesecake! This looks so good! this looks so darn good. i love cheesecake especially with a lil chocolate and strawberries! I think the best part of this cake is that you made it because your nephew wanted it. That's such a sweet story. And of course, it looks delicious. Such a great time of year to add strawberries to dessert. They're so extra sweet right now. This looks so delicious! Cheesecake is my favorite! Chocolate + strawberry is one of my fave combos! This is right up my alley! This looks SO GOOD!!! What an amazing dessert, I need to make this!! Wow! This looks like a great recipe for summer! You can't go wrong with chocolate and strawberry. A classic flavor combination. Cheese cake is my dad's absolute favorite! I may have to make this for him for Father's Day! You had me at "strawberry" and "chocolate." I am definitely going to try this recipe. I've never made a cheesecake before but am excited to give this a try. Thank you.